OUTTHINK, OUTPACE AND OUTPERFORM THE COMPETITION Now revised and updated with new applications and practical tools to better use your brain in business If you think your business can’t get any better, think again. 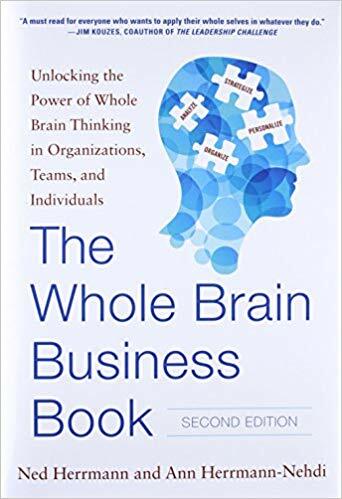 Thanks to the power of Whole Brain® Thinking, you can apply what we know about thinking and the brain to transform your organization at every level. Whether you’re struggling to keep up with a changing market, stuck with a tired business model, or challenged by difficult colleagues, the proven methods in this updated guide will help you to: IDENTIFY how you and others prefer to think IMPROVE your communication skills INSPIRE creative thinking in yourself and others INNOVATE faster and work more efficiently IMPLEMENT changes throughout your organization INCREASE productivity and beat the competition Every business runs on thinking. This book gives you practical tools to assess others’ mindsets and get more intentional about how you use your thinking—and how to best engage the thinking of those around you. Filled with essential charts, engaging examples, exercises, and action steps, The Whole Brain Business Book shows you how to rethink your business, prepare for the future,realign your goals, and reinvigorate your team—by putting your whole brain to work.